Lemon poppyseed anything gets my vote any day! Yet, if you're on a healing diet or trying to lose weight, the usual lemon poppyseed desserts are a big no-no because of the sugar and refined flour. 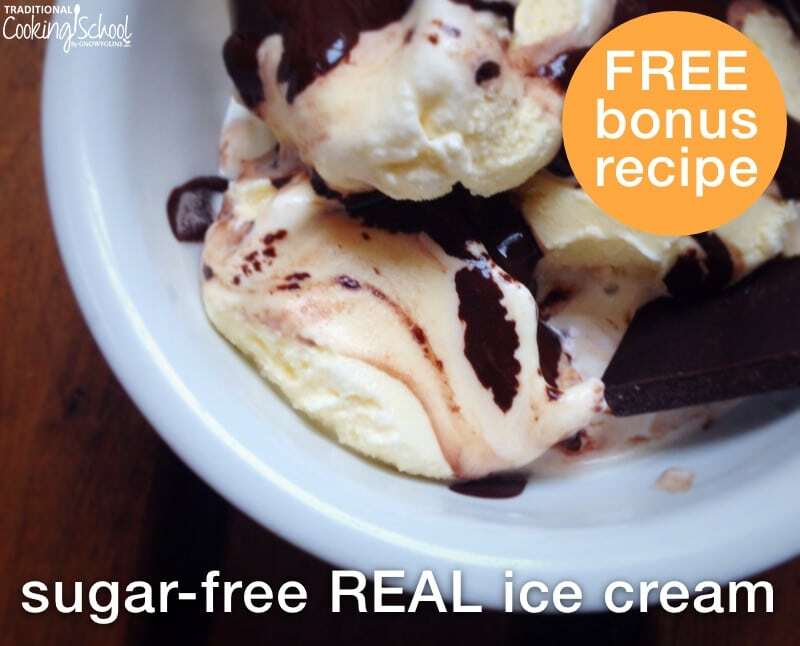 You can enjoy it guilt-free because the recipe uses nourishing ingredients… and there's no sugar! This recipe comes from my friend Lindsey's Sweet Without Sugar eCookbook that's currently 40% off. She's graciously agreed to share the recipe here with you. Thank you, Lindsey! 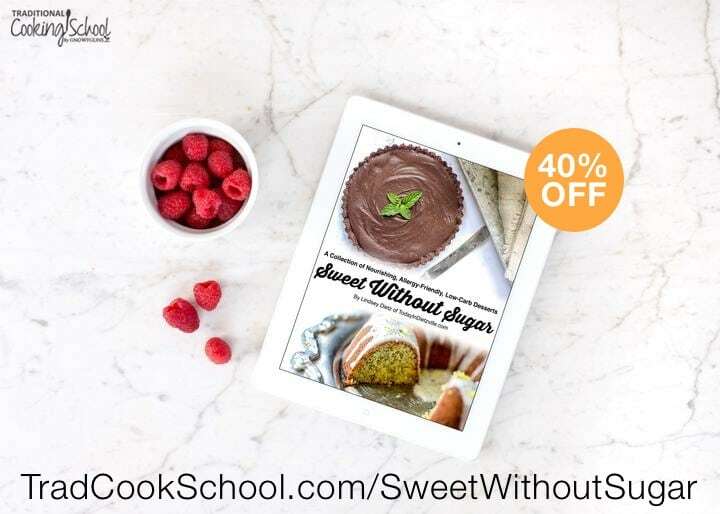 Click here for more info on the 40% OFF Sweet Without Sugar eCookbook. And now for the recipe! It's a keeper! You'll make it again and again like we do, I'm sure of it. Enjoy! Lemon poppyseed anything is my favorite... even over chocolate. Yet, if you're on a healing diet or trying to lose weight, the usual lemon poppyseed desserts are off-limits. Not this one! 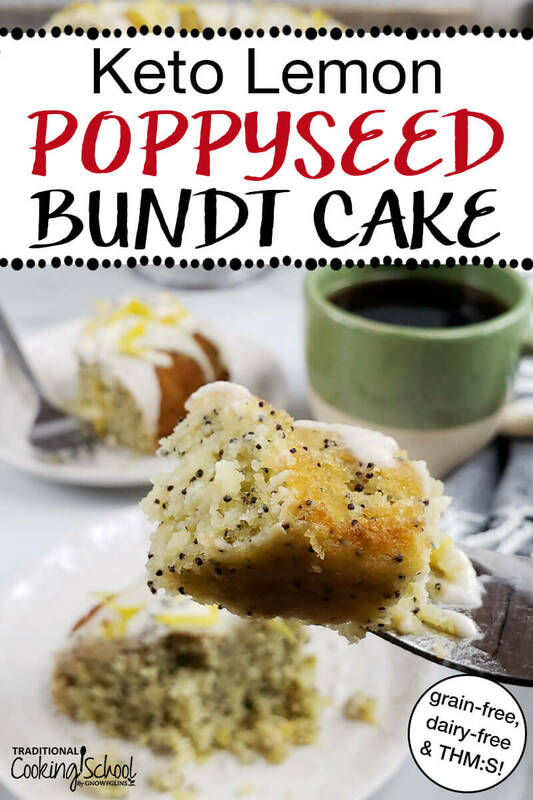 Dairy-free, grain-free, and sugar-free, this Keto Lemon Poppyseed Bundt Cake is perfect for low-carb lifestyles or Trim Healthy Mamas looking for S desserts! Preheat the oven to 320° F.
Whisk together all the dry ingredients in a large bowl and set aside. In the bowl of a stand mixer fitted with the paddle attachment, cream together the shortening and sweetener. Add the remaining wet ingredients and mix until combined. Add 1/3 of the dry ingredients and incorporate. Continue adding in 1/3 of the dry ingredients at a time, allowing each third to fully incorporate before adding more. This is a thick cake batter. After pouring it into the cake pan, smooth it out with a spatula. Bake 35 minutes or until a toothpick inserted comes out clean. Remove from the oven and cool for 10 minutes. Then turn out onto a cooling rack. Cool completely before glazing with Quick Lemon Glaze. Garnish with additional lemon zest and/or poppy seeds if desired. Whisk the lemon juice and powdered sweetener blend until smooth. Drizzle all of the glaze generously over the cake. Do you love lemon poppyseed bundt cake? Will you try this sugar-free, keto version? Thoughts on monk fruit instead of these other sugar alternatives? We’ve not researched monk fruit enough to comment regarding its use as a sugar alternative. Sorry we can’t help further with this. I just made this, and wow! What an absolute disaster. The only mistake I made was adding half of the sweetener to the dry ingredients, but I caught it and creamed the rest with the wet ingredients. I don’t think that should have resulted in the cake falling out of the pan in big crumbly chunks (and a bunch of little crumbs.) The taste was perfection, but cake is better when sliced! Any ideas what could have made it such a crumbly mess? Sorry to hear this, Lisa! I also spoke with a TCS team member about this, and our collective thoughts are: 1. Maybe your pan wasn’t greased? 2. The cake didn’t cool completely before turning it out of the pan? I do hope you’ll try again. This is one of our family’s favorite cakes! I make it often, so I know the recipe works as-written. Please let me know if I can be of further help! Is there a way to use honey instead? I love lemon poppy seed and am currently on the GAPS protocol. We have not tried substituting honey in this recipe. If you do substitute honey you would need to use less than the 1/2 cup since honey is sweeter than other sweeteners. Another consideration when using honey is you would be substituting a liquid sweetener for a powdered sweetener you may find your batter is looser. Substituting honey in this recipe will no longer make this Trim Healthy Mama approved. Thank you for your reply. Is your stevia blend in the wet ingredients a liquid? If that is a powder do you think adding 1/2 tbsp coconut flour might balance it. What is trim healthy mama? Does it include any grains? Is coconut oil an acceptable substitute for the palm shortening? I don’t have any of that on hand. You can try subbing coconut oil, Toni. Is there anyway we could get the nutrition information? Like carbs etc? We do not provide food values because of the variations involved in traditionally preparing foods. Is is possible to use an egg substitute? We have a family member with an egg allergy. Sorry, Christine, I haven’t tried this recipe without eggs. If I were to try it, I would probably use chia eggs. Is collagen the same as beef gelatin? Gelatin is made of collagen. The main difference between gelatin and collagen is that collagen will not gel and can be dissolved in both hot and cold liquids. Some people may also find collagen easier to digest than gelatin. Just made this today. Wish I could post a picture of how beautifully it came out! I’ve recently gone dairy free along with eating THM so I was very excited to find this recipe!! Thank you SO much! Will make it again soon! I made the recipe today using coconut oil instead of palm shortening and it turned out delicious. I don’t have a bundt pan so I just baked it as a sheet cake, drizzling the glaze over the cake in the pan. Used Meyer lemons. Totally yummy! Are the poppy seeds optional? I have not made this without the poppy seeds but you could try it. I assume the poppy seeds aren’t necessary as I assume they don’t provide a fat/oil or moisture for the cake. Would you agree? Also, could I substitute anything else for the collagen? I assume the collagen helps thicken the cake so what about something like chia seeds or cornstarch or arrowroot for thickening? 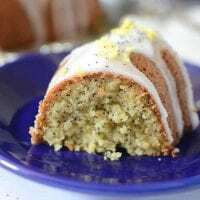 Correct, you can leave the poppy seeds out if you choose and have a lovely lemon bundt cake! To answer your second question: I actually use collagen as a flour for this cake. And, because it’s a low-carb/keto recipe, flours like corn starch or arrowroot are not allowed because they aren’t low-carb. Chia seeds would act too much as a binder, therefore I wouldn’t recommend them. If you have an unflavored, grass-fed, non-denatured whey protein powder, you can sub an equal amount of that. Otherwise, I developed this recipe with the collagen as a protein addition and low-carb flour source, so that is why it’s an ingredient. Hope that helps! Alternatives to the almond flour? I’m allergic. Another seed/nut flour like cashew or hazelnut might work. Would this recipe work with Vital Proteins Collagen Peptides (unflavored)? Thank you!